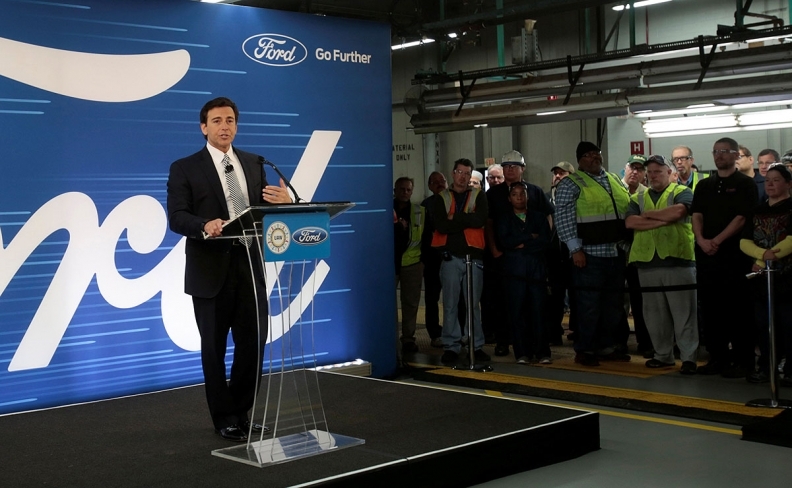 Ford said it will spend US $150 million at the Michigan Assembly Plant in addition to the US $700 million that was pledged two years ago as part of the automaker's contract with the United Auto Workers union. Automotive parts suppliers in Ontario view new Ford Motor Co. spending in the state of Michigan as a sign of stability and a vote of confidence in the region's auto sector. Ford said March 28 it will add US $350 million in new investment at two Michigan assembly plants on top of previously-pledged spending. The automaker said it will spend US $150 million at the Michigan Assembly Plant in addition to the US $700 million that was pledged two years ago as part of the automaker’s contract with the United Auto Workers union. Ford will also invest US $200 million in its Flat Rock Assembly Plant for an advanced-data centre. The latest planned spending at Flat Rock follows a US $700 million investment announced by CEO Mark Fields in January. Ford of Canada didn't immediately say whether the announcements in Michigan would have a ripple effect on operations in Ontario. It builds engines in Windsor and the Ford Edge, Ford Flex, Lincoln MKX and Lincoln MKT in Oakville. Ontario and Michigan make more cars than all of Mexico combined. The two jurisdictions also build as many cars as the Southeastern United States. The Province of Ontario and State of Michigan in 2016 signed a memorandum of understanding to increase the region’s competitiveness in the automotive industry. The agreement is designed to create best practices, cohesive public policy, increased supply chain integration and technology transfer agreements. Volpe said an announcement like the one by Ford allows suppliers to plan better for the future. Employees at Michigan Assembly Plant in Detroit will begin building Ranger at the end of 2018 and the Bronco in 2020. Volpe said tooling for those two vehicles is probably done at this point but he isn’t sure how many Ontario suppliers eventually won work from Ford. Tony Faria, of the University of Windsor’s Office of Automotive and Vehicle Research, said 60 per cent of all automotive parts built in Canada are shipped to the United States. “For the most part the great, great bulk are going to the more northern U.S. plants,” he said.